BOUNTY TOURNAMENT – Now EVERY Sunday! Each player receives one bounty token upon entry. When a player busts out, the winner of the hand gets any bounty tokens that have been accumulated. Bounty tokens are paid out at the start of the final table ($15 per token). CLOSED Thursday 11/26/15. Happy Thanksgiving! Please come check out our new commercial Saturday, November 28th at 8:30pm! 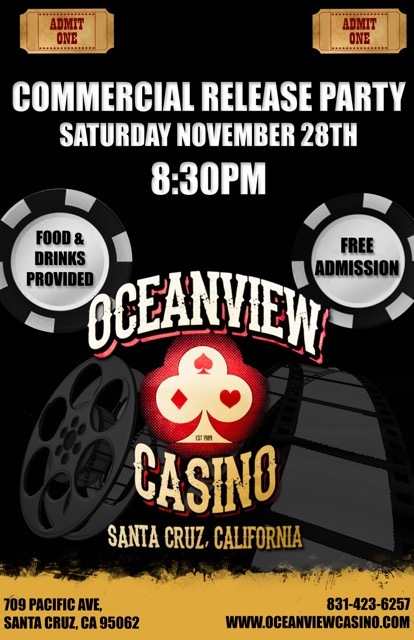 Join the Oceanview Staff along with the creator/director in celebrating the release of our first commercial! Food and drinks will be provided. See you there! Bigger buy-in tourney the first Tuesday of every month! $50 buy-in plus $10 entry fee – 2500 in chips. Unlimited $40 re-buys the first three rounds – with potential extended re-buy period (floorperson’s discretion). Double re-buys allowed on bust-outs within that period – 2500 chips per re-buy. One $40 add-on for 5000 in chips – you must make it to the end of the re-buy period to purchase the add-on. we will be spreading 2 Blackjack tables on friday nights starting at 9pm.